Here’s another OOTD post! Actually I wore this outfit yesterday for my uncle’s wedding! Yay! I Wore a Saree!! Traditional India weddings are truly fantastic. I love India weddings. The rituals, the traditions and the vows, all makes me feel how rich and joyful our culture is! Listening to the 7 vows of weddings was an entire new thing for me as in my brother’s wedding during the vows taking ceremony, I was busy with the preparations of next ceremony. Anyways, coming back to the post. Well, as it was my uncle’s wedding… I hardly got change to click pictures. So here are three pictures from yesterday’s function. My sil took these pictures after we were done with dancing and having dinner! Picture quality is not so good but I couldn’t resist sharing these pictures. I really like the sober color combination with bling border in this saree. I rarely wear blingy clothes but this one is an exception. 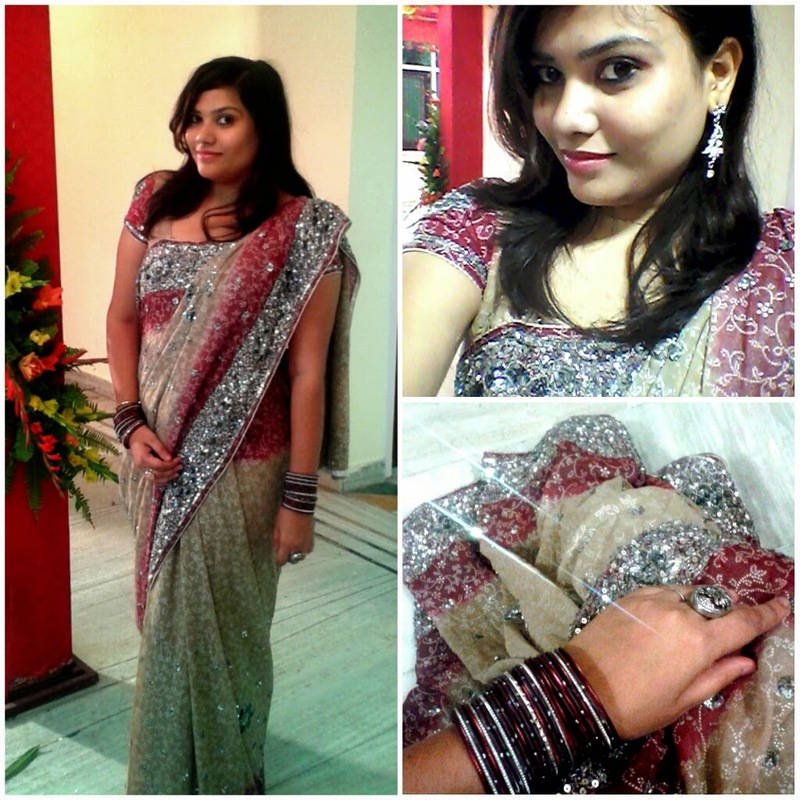 Its a saree from Meena Bazar (the brand not the place/local market) and accessories are from Sia jewelry!